Vasco da Gama's reluctance to embrace modernity could see the club repeating past mistakes. Tradition clashed with modernity when Rio de Janeiro rivals Fluminense and Vasco da Gama faced each other in the 14th round of the Brazilian Championship, and old practices could not be maintained in a new setting. The city’s giant Maracana stadium was built for the 1950 World Cup. Afterwards, Vasco won the first Rio State title played in the ground. As a reward, they were allowed to choose the end of the ground to be used by their supporters. Vasco opted for the right side, looking out from the press box and the TV gantry – and they have been there ever since. After the 2014 World Cup, though, we are in a new era. The stadium looks the same from the outside. Inside, though, it is unrecognisable, and the method of administration has also changed. Previously the stadium was municipal. Now, on a concession basis, it is run by a private consortium – which has a contract with two of the local clubs, Flamengo and Fluminense. 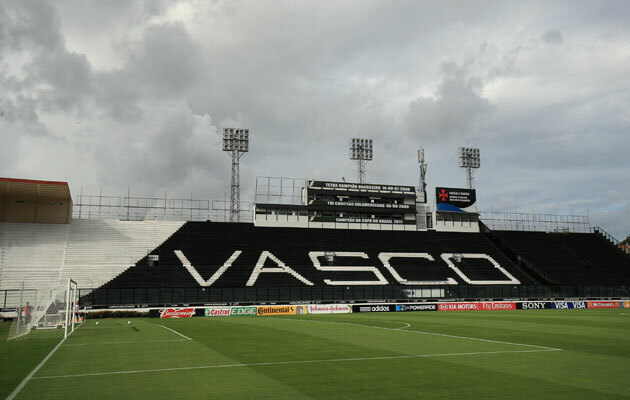 There is no contract with Vasco, who stage the vast majority of their home games in their own Sao Januario stadium. And anyway, Sunday’s match was a home game for Fluminense – meaning that the contract between the club and the consortium was in effect, and the tickets for the end of the ground to the right were being sold to Fluminense fans. Vasco were outraged. Under ever controversial president Eurico Miranda the club first threatened not to turn up for the game. Then Miranda and the directors decided to boycott the occasion, and advised Vasco fans not to go. A small group refused his call. In a crowd just below 38,000 – boosted by the fact that Fluminense were presenting new signing Ronaldinho Gaucho – there were almost certainly less than 2,000 Vasco fans in the unaccustomed seats away to the left. It could be that Vasco, on a much smaller scale, are repeating a historic error. In an early twentieth century soccer scenario dominated by the elite, Vasco were the revolutionaries. The other big clubs of Rio, at the time Brazil’s capital, were all based in the city’s rich south zone. Vasco were from the working class north, a reality reflected in the team that won the Rio title in the debut season in the first division back in 1923; the Vasco line up included poor white and black players. Facing plenty of elite prejudice, the club had to fight hard to consolidate itself, which it did with the construction of its Sao Januario ground in 1927. The following decade was a crucial one in the history of Brazil and the development of football in the country – and here the once revolutionary club now positioned itself on the other side of the line. In the battle to establish professionalism in the Brazilian game, Vasco held out for the amateur model. Flamengo saw the opportunity. They were in favour of professionalism, and, with a visionary president, they signed the leading three black players of the day. At a stroke, an elite club was able to rebrand itself as the team of the masses, stealing Vasco’s thunder. Eight decades later, Flamengo against Vasco, ‘the derby of the multitudes,’ remains Rio’s most fiercely contested derby, and much of the content of the rivalry comes from this period. Whatever the pros and cons of the post-2014 Maracana, a new era has begun. Rather than harking back to the past, this might be the time for Vasco to be involved in the quest to construct new traditions. It is a time for Vasco da Gama to show its revolutionary face, and not its conservative one. At least on Sunday the small contingent of Vasco fans inside the Maracana ended the game as a happy few. Fluminense would have gone top of the table with a win. Instead Vasco, who had scored just 5 goals in the previous 13 rounds, found form at last and claimed a 2-1 victory, with eternal promise Jhon Cley setting up the first and scoring the second with a long range cracker. Vasco remain in the relegation zone, but the club’s diehards could point to a moral message – Cley’s second half winner flew into the net at the end where after six decades the club’s fans had been evicted by the forces of modernity.